Contains Randomized Practice Test for Certification Exam! This interactive CD-Rom provides field service personnel with the necessary training and practical knowledge to safely perform service on systems containing R-410A and R-407C. 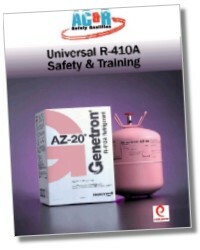 In addition, this CD includes information on: the R-22 phase-out, appropriate refrigerant and oil applications, service techniques, as well as safe handling of R-410A. This CD breaks down R-410A training into categories each with specific sub topics. Each category contains practice questions. 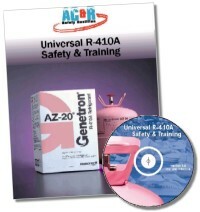 All of the Information needed to prepare for the R-410A Safety Certification is contained in this interactive CD-ROM.